If you haven’t heard this some from me already, I love to use simple and natural products around my home. Chemicals are no longer the in thing. They hurt the environment, can be caustic to your health and can actually cost more money. Going Green has many benefits.Not only can they be cheaper, but they are better for your health. In my house, my master bathroom sink seems to get clogged a lot (my fault actually). This is where I do my hair everyday, right over the sink. I actually sat down and started searching the internet for various ingredients that would unclog my stubborn hair infected sink. This recipe is a combination of others I found from my search on pinterest. I have tried many recipes out there and I decided to do my own investigating and came up with this combo. I love it because it works like a charm. 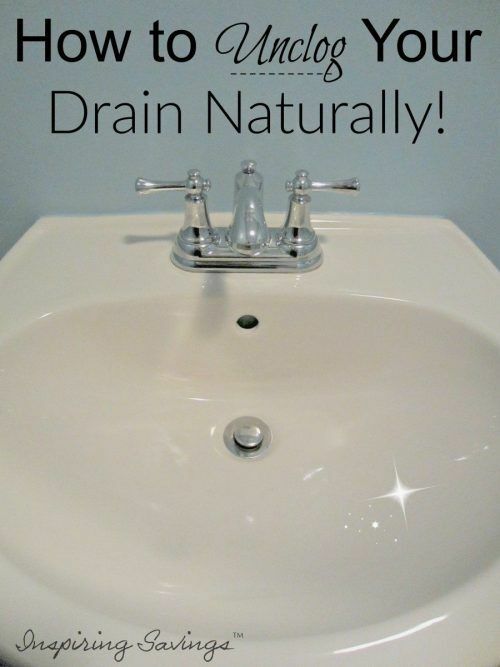 Carefully place the baking soda down the drain. Pour in half the vinegar down the drain making sure that the top is fully covered. This will allow it work on the drain and not allow it to rise out. Let it sit until it settles then add the rest of the vinegar. Let it sit for roughly 15 minutes. Then flush it with the boiling water. I have only used this recipe in my sink. I have not had to deal with a clogged shower drain, but I am sure it will work the same. This same recipe works AWESOME (Minus the boiling water) as a 3rd grade science project,VOLCANO.